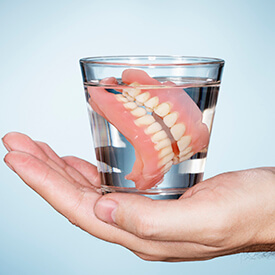 Dentures have been used to replace missing teeth for hundreds of years now, and many patients still prefer their accessibility, convenience, and age-old reliability today. At Roselle Park Dental & Implants, our doctors and team members are committed to helping you find the tooth replacement solution that best fits your individual needs, which is why we offer both traditional dentures and implant-retained dentures to those in need. Please contact our Roselle Park, NJ office today if you have any questions we can help you with, or if you’re ready to schedule your first consultation. Full dentures are designed to replace an entire arch of missing teeth, and they stay in place within the mouth through the power of natural suction and sometimes a little added denture adhesive. Alternatively, partial dentures are meant to replace certain teeth along a certain arch (top or bottom) while allowing the remaining natural teeth to stay safely in place, and they attach securely in place with the help of brackets and/or clips. Both types of dentures are designed to be removable, which means that patients can clean them separately from the mouth and store them during sleep. It is likely that your new denture will feel a little awkward in the mouth for the first few weeks after you’ve received the finished prosthetic from Roselle Park Dental & Implants. You should become accustomed to it easily enough over time as long. We recommend that you eat soft foods at first to help the process. It’s important to always stand over a sink or a folded towel when handling your denture so that it won’t be damaged if you accidentally drop it. Brush the appliance carefully each day just like you would your regular teeth to remove stray food and plaque. Use a denture brush if possible, and avoid brushes with hard bristles, as these can cause damage. Even if you’re wearing a full denture, make sure to still take good care of your mouth as well by brushing the gums and tongue each day before you put it in.